But what is this system, that is supposedly as smart as a 4 year old? It's a program that answers vocabulary and similarity questions as well as a human 4 year old, drawing on MIT's ConceptNet database. But obviously, this Illinois/MIT software lacks the ability to learn new skills, to play, to experiment, to build, to improvise, to discover, to generalize beyond its experience, etc..... It has basically none of the capabilities of the mind of a 4 year old child. BUT... one thing is clear ... these universities do have excellent PR departments! The contrast between their system -- a question-answering system based on MIT's ConceptNet knowledge base -- and the system OpenCog, Hanson and I are building is both dramatic and instructive. The Illinois/MIT program is, they report, as good as a human 4 year old at answering vocabulary and similarity questions. OK, I believe that. But: Big deal! A calculator is already way better than a human 4 year old at answering arithmetic questions! What we are after with our project is not just a system that passes certain tests as well as a human toddler. We are after a system that can understand and explore the world, and make sense of itself and its surroundings and its goals and desires and feelings and worries, in the rough manner of a human toddler. This is a wholly different thing. But a question-answering system based on ConceptNet doesn't particularly build toward anything -- it doesn't learn and grow. It just replies based on the data in its database. It is unfortunate, but not terribly surprising, that this kind of distinction still needs to be repeated over and over again. General intelligence - the ability to achieve a variety of complex goals in a variety of complex environments, including goals and environments not foreseen in advance by the creators of the intelligent system -- is a whole different kettle of fish than engineering a specialized intelligent system for a specific purpose. The longer I work on AGI, the more convinced I am that an embodied approach will be the best way to fully solve the common sense problem. The AI needs to learn common sense by learning to control a robot that does commonsensical things.... Then the ability to draw analogies and understand words will emerge from the AI's ability to understand the world and relate different experiences it has had. Whereas, a system that answers questions based on ConceptNet is just manipulating symbols without understanding their meaning, an approach that will never lead to real human-like general intelligence. The good news is, my OpenCog colleagues and I know how to make a robot that will achieve first toddler-level commonsense knowledge, and then full-scale human-adult level AGI. And then what? The less exciting news is, it's going to take a lot of work -- though exactly how many years depends on how well funded our project is. Today Damien Broderick pointed out to me an Edge interview with physicist Lee Smolin, which led me to a fascinating article by Smolin titled "Precedence and freedom in quantum physics." Smolin's article is deep and thought-provoking -- and overlaps greatly with prior thinking by some other folks, such as Rupert Sheldrake and Charles Peirce and myself. Principle of precedence: When a quantum process terminating in a measurement has many precedents, which are instances where an identically prepared system was subject to the same measurement in the past, the outcome of the present measurement is deter- mined by picking randomly from the ensemble of precedents of that measurement. Or as he puts it in his Edge interview, "nature is developing habits as it goes along." I propose that memory is inherent in nature. Most of the so-called laws of nature are more like habits. The idea is that there is a kind of memory in nature. Each kind of thing has a collective memory. So, take a squirrel living in New York now. That squirrel is being influenced by all past squirrels." The habits of nature depend on non-local similarity reinforcement. Through morphic resonance, the patterns of activity in self-organizing systems are influenced by similar patterns in the past, giving each species and each kind of self-organizing system a collective memory. Sheldrake's core idea regarding morphic fields is that, once a pattern occurs somewhere in the universe, it is more likely to occur elsewhere. I have no idea whether Smolin will appreciate this parallel, though. Sheldrake has developed his morphic field idea fairly extensively as an explanation for psi phenomena, which are widely viewed with skepticism within the scientific community, although they are broadly accepted by the general public, and in my own opinion the evidence for their reality in many cases is pretty strong (see my brief page on psi here). Logical analysis applied to mental phenomenon shows that there is but one law of mind, namely that ideas tend to spread continuously and to affect certain others which stand to them in a peculiar relation of affectibility. In this spreading they lose intensity, and especially the power of affecting others, but gain generality and become welded with other ideas. The one intelligible theory of the universe is that of objective idealism, that matter is effete mind, inveterate habits becoming physical laws. But before this can be accepted it must show itself capable of explaining the tridimensionality of space, the laws of motion, and the general characteristics of the universe, with mathematical clearness and precision ; for no less should be demanded of every Philosophy. I also notice an interesting parallel between Smolin's paper and my own paper on Morphic Pilot Theory from a few years ago. In that paper, I was trying to connect Sheldrake's morphic field idea with quantum theory, and I posited that one could look at the tendency to take habits as an additional property of the "pilot waves" that Bohmian theory posits to underly quantum reality. Specifically, I argued that if one viewed pilot waves as being directed by simplicity, as quantified e.g. by algorithmic information (in which something is simpler if it can be computed by a shorter program), then one could derive a variant of the morphic field hypothesis as a consequence. Well, well, well.... Obviously Smolin did not read my speculative paper on quantum theory and psi, but he and his colleagues independently arrived at a similar conclusion to that paper. So science often goes. All this, of course, is still preliminary and speculative. For one thing, I find the axiomatic foundation for quantum mechanics that Smolin chose a bit inelegant, though probably better than the Bohmian pilot waves I used in my own paper; and I would love to see how an algorithmic simplicity assumption can be integrated into the much prettier and more fundamental symmetry based foundation for quantum mechanics recently articulated by Kevin Knuth and his colleagues. But one does see, here, an interesting direction for bridge-building between quantum theory, morphic fields and psi phenomena. The connection between psi and quantum mechanics has been discussed a lot, but I've never been convinced that quantum theory on its own can explain psi. In my Morphic Pilot paper I suggested that augmenting quantum theory with an algorithmic information theory based morphic field type assumption might do the trick. Without explicitly thinking about psi at all (so far as I can tell, anyway), Smolin has made an interesting move in the same direction. All this also makes me wonder about the findings of Aerts, Atmanspacher and others regarding the necessity, in some case, of modeling classical systems using quantum mathematics and logic. Could it be the case that, whenever a system internally displays a morphic resonance type dynamic, it is best to model it using some variant of quantum math? Lots of yummy food for thought! What a bummer to read that Ray Manzarek has died. Hendrix was and probably always will be my greatest musical hero -- but Ray Manzarek was the first keyboardist who amazed me and showed me the power of wild and wacky keyboard improvisation. I now spend probably 30-45 minutes a day improvising on the keyboard (and more on weekends!). I don't have Ray's virtuosity but even so, keyboard improv keeps my mind free and agile and my emotions on the right side of the border between sanity and madness. Each day I sit at my desk working, working working -- and when too much tension builds up in my body or I get stuck on a difficult point, I shift over to the piano or the synth and jam a while. My frame of mind re-sets, through re-alignment with the other cosmos the music puts my mind in touch with. The Singularity, if it comes, will bring us beyond petty human concerns into other realms in a dramatic, definitive way. Heartfelt, imaginative improvisation like Ray Manzarek's can do something similar, in its own smaller (yet in another sense infinite) way -- opening up a short interval of time into something somehow much broader. I recall a Simpsons episode where Homer gets to heaven and encounters Jimi Hendrix and Thomas Jefferson playing air hockey. Maybe my memory has muddled the details, but no matter. 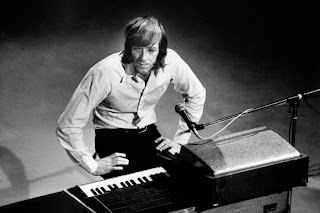 I hope very much that, post-Singularity, one of my uploaded clones will spend a few eons jamming on the keyboard with the uploaded, digi-resurrected Ray Manzarek. Among many other notions that I won't try to summarize here, he pointed out that, e.g. energy (in the sense he meant) is different from arousal as psychologists like to talk about… You can have a high-energy state without being particular aroused -- i.e. you can be high-energy but still and quiescent. This started me thinking about the relation between "mental energy" in the subjective sense Gino appeared to be intending, and "energy" in physics. I have sometimes in the past been frustrated by people -- less precise in their thinking than Gino -- talking about "energy" in metaphorical or subjective ways, and equating their intuitive notion of "energy" with the physics notion of "energy." Gino was being careful not do to this, and to distinguish his notion of mental energy from the separate notion of physical energy. However, I couldn't help wondering about the connection. I kept asking myself, during the conversation: Is there some general notion of energy which the physical and mental conceptions both instantiate? Highly General Formulations of Force, Energy, Etc. Anyway... here is my rough attempt to generalize energy and some other basic physics concepts beyond the domain of physics, while still capturing their essential meaning. However, the basic concepts of force and energy as described above are pertinent beyond the Newtonian context, e.g. to relativistic and quantum physics; and I suppose they may have meaning beyond the physics domain as well. Entropy maximization: When a mind lacks knowledge about some aspect of the world, its generically best hypothesis is the one that maximizes entropy (this is the hypothesis that will lead to its being right the maximum percentage of the time). This is Jaynes' MaxEnt principle of Bayesian inference. Maximum entropy production: When a mind lacks knowledge about the path of development of some system, its generically best hypothesis is that the system will follow the path of maximal entropy production (MEP). It happens that this path often involves a lot of temporary order production; as Swenson said, "The world, in short, is in the order production business because ordered flow produces entropy faster than disordered flow"
Note that while entropy maximization and MEP are commonly thought of in terms of physics, they can actually be conceived as general inferential principles relevant to any mind confronting a mostly-opaque world. Sooo... overall, what's the verdict? Does it make sense to think about "mental energy", qualitatively, as something different from physical energy -- but still deserving the same word "energy?" Is there a common abstract structure supervening both uses of the "energy" concept? I suppose that there may well be, if the non-physical use of the term "energy" follows basic principles like I've outlined here. In What Sense Is Mental Energy Conserved? But ... hmmm ... I wonder if the notion of "mental energy" -- in folk psychology or in whatever new version we want to create -- really obeys the principles suggested above? In particular, the notion of "conservation in isolated systems" is a bit hard to grab onto in a psychological context, since there aren't really any isolated systems ... minds are coupled with their environments, and with other minds, by nature. On the other hand, it seems that whenever physicists run across a situation where energy may seem not to be conserved, they invent a new form of energy to rescue energy conservation! Which leads to the idea that within the paradigm of modern physics, "being conserved" is essentially part of the definition of "energy." Also, note that above I used the phrasing that energy "is conserved in an isolated system (or to say it differently: is added or subtracted from a system only via interactions with other systems)." The alternate parenthetical phrasing may, perhaps, be particularly relevant to the mental-energy case. 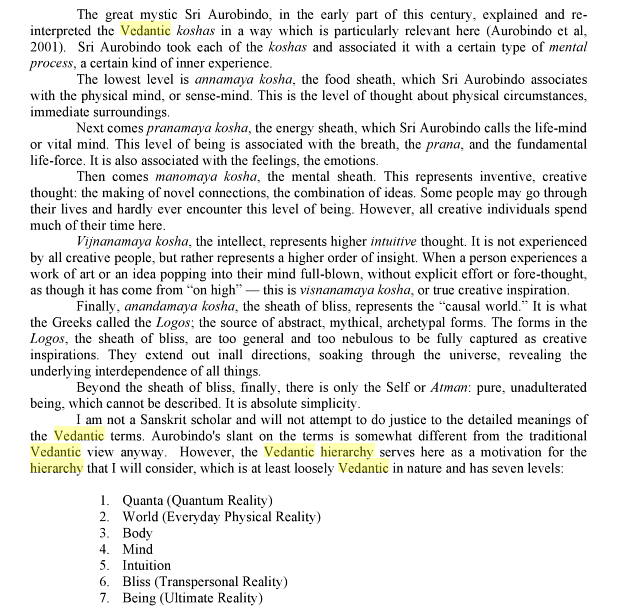 In a Vedantic context, one could perhaps view the Realm of Bliss as being a source of mental energy that is in effect infinite from the human perspective. So when a human mind needs more energy, it can potentially open itself to the Bliss domain and fill itself with energy that way (thus perhaps somewhat losing its self, in a different sense!). This highlights the idea that, in a subjective-mind context, the notion of an "isolated system" may not make much sense. Increase or decreases in a mind-system's fund of mental energy, are causally tied to that mind-system's interactions with the universe outside itself. While eating ramen soup with Ruiting in the Tai Po MegaMall tonight, I found myself musing about the possible use of the contraction mapping theorem to understand the properties of AGI systems that create other AGI systems that create other AGI systems that … etc. …. It's a totally speculative line of thinking, that may be opaque to anyone without a certain degree of math background. But if it pans out, it ultimately could provide an answer to the question: When can an AGI system, creating new AGI systems or modifying itself in pursuit of certain goals, be reasonably confident that its new creations are going to continue respecting the goals for which they were created? This question is especially interesting when the goals in question are things like "Create amazing new things and don't harm anybody in the process." If we create an AGI with laudable goals like this, and then it creates a new AGI with the same goals, etc. -- when can we feel reasonably sure the sequence of AGIs won't diverge dramatically from the original goals? Of course, to make goal space a complete metric space one probably needs to admit some uncomputable goals, i.e. goals only computable using infinitely long computer programs. So a goal like G* can never quite be achieved using ordinary computers, but only approximated. Anyway, G* probably doesn't seem like a very interesting goal… apart from a certain novelty value…. However, one can vary on the above argument in a way that makes it possibly more useful. -- i.e., the goal of creating an AGI that can adequately figure out how to achieve goals G and I within resources C.
At each stage of the iteration, the AGI becomes more and more intelligent, as it's dealing with more and more abstract learning problems. But according to the contraction mapping theorem, the AGI systems in the series are getting closer and closer to each other -- the process is converging. So then we have the conclusion: If one starts with a system smart enough to solve the problem agi(G,I, C) reasonably well for the given I and C -- then ongoing goal-directed creation of new AGI systems will lead to new systems that respect the goals for which they were created. Which may seem a bit tautologous! But the devil actually lies in the details -- which I have omitted here, because I haven't figured them out! The devil lies in the little qualifiers "acceptably" and "reasonably well" that I've used above. Exactly how well does the problem agi(G,I,C) need to be solved for the contraction mapping property to hold? And of course, it may be that the contraction mapping property doesn't actually hold in the simple form given above -- rather, some more complex property similar in spirit may hold, meaning that one has to use some generalization of the contraction mapping theorem, and everything becomes more of a mess, or at least subtler. So, all this is not very rigorous -- at this stage, it's more like philosophy/poetry using the language of math, rather than real math. But I think it points in an interesting direction. It suggests to me that, if we want to create a useful mathematics of AGIs that try to achieve their goals by self-modifying or creating new AGIs, maybe we should be looking at the properties of mappings like agi() on the metric space of goals. This is a different sort of direction than standard theoretical computer science -- it's an odd sort of discrete dynamical systems theory dealing with computational iterations that converge to infinite computer programs compactly describable as hypersets. A great deal of human unhappiness and ineffectiveness is rooted in what Buddhists call "attachment"… roughly definable as an exaggerated desire not to be separated from someone, something, some idea, some feeling, etc. Buddhists view attachment as ensuing largely from a lack of recognition of the oneness of all things. If all things are one, then they can't really be separated anyway, so there's no reason to actively resist separation from some person or thing. 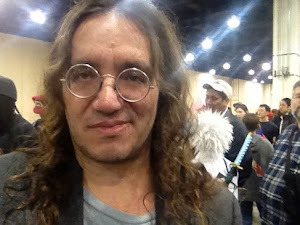 Zen teacher John Daido Loori put it as follows: "[A]ccording to the Buddhist point of view, nonattachment is exactly the opposite of separation. You need two things in order to have attachment: the thing you’re attaching to, and the person who’s attaching. In nonattachment, on the other hand, there’s unity. There’s unity because there’s nothing to attach to. If you have unified with the whole universe, there’s nothing outside of you, so the notion of attachment becomes absurd. Who will attach to what?" In this blog post I will present a simple neural and cognitive model of attachment and its opposite. I want to clarify that I'm not positing that the subjective experiences of attachment or non-attachment "reduce" to the neural/cognitive mechanisms I'll describe here -- I am not: not in a physics sense nor in a basic ontological sense. I prefer to think about the ideas presented here as pertaining to the "neural/cognitive correlates of the experiences of attachment and non-attachment." I will start with some quasi-biological speculation. What might be the neural roots of attachment? Let's begin with the concept of Hebbian learning, an idea from neural network theory. Hebbian learning has to do with a network in which neurons are joined by weighted synapses. The larger the positive weight on the synapse between neuron N1 and neuron N2, the more of N1's activity will spill over to N2. The larger the negative weight on the synapse between neuron N1 and neuron N2, the more strongly N1's activity will inhibit activity in N2. This is a very basic form of pattern recognition, but it's been shown to be adequate to learn arbitrarily complex patterns. In technical terms, Hebbian learning can learn to achieve any computable goal in any computable environment -- though it may be very slow at doing so, and may require a very large network of neurons. One of the interesting consequences of Hebbian learning is the formation of "cell assemblies" -- groups of neurons that are richly interconnected via high-positive-weight synapses, and hence tend to become activated as a whole. Donald Hebb, who came up with the idea of Hebbian learning in the late 1940s, suggested that ideas in the mind are represented by neuronal cell assemblies in the brain. 60-odd years later, this still seems a sensible idea, and there is significant evidence in its favor. The emergence of nonlinear dynamics has deepened the theory somewhat; it now seems likely that the cell assemblies representing ideas, memories and feelings in the human mind are associated with complex dynamical phenomena like strange attractors and strange transients. Hebbian learning is a conceptual and mathematical model, but the basic idea is reflected in the brain in the form of long-term potentiation of synapses. It may be found to be reflected in the brain in other ways as well, e.g. as our understanding of the roles of glia in memory increases. So what does all this have to do with attachment? Suppose that Bob's girlfriend has left him. He misses her. While his girlfriend was with him, he woke up every morning, found her in the bed next to him, and put his arm around her. He liked that. The association between "wake up" and "put arm around girlfriend" become strong. In Hebbian learning terms, the neurons in the "wake up" cell assembly got strongly positively weighted synapses to the neurons in the "put arm around girlfriend" cell assembly. A larger assembly of the form " wake up and put arm around girlfriend" formed, linking together the two smaller assemblies. Now, after the girlfriend left, what happens in Bob's brain? According to straightforward Hebbian learning, the association between "wake up" and "put arm around girlfriend" should gradually decrease, until eventually there is no longer a positive weight between the two cell assemblies. The larger assembly should fragment, leaving the "wake up" and "put arm around girlfriend" assemblies separate; and at the same time the "put arm around girlfriend assembly should start to dissipate, as it no longer gets reinforcement via experience. But this may not actually be what happens. Suppose, for example, that Bob spends a lot of time thinking about his girlfriend (now his ex-girlfriend). Suppose he lies awake at night in bed and dwells on the fact that he's the only one there. In that case, the "wake up" cell assembly and the "put arm around girlfriend" assembly will be activated simultaneously a lot, and will retain their positive association. What's happening here is that Bob's emotions are causing a cell assembly to remain highly active -- in a case where the external world, in the absence of these emotions, would drive the assembly to dwindle. This, I suggest, is the key neural correlate of the psychological phenomenon of attachment. Attachment occurs -- neurally speaking -- when there is a circuit binding a cell assembly to the brain's emotional center, in such a way that emotion keeps the circuit whole and flourishing even though otherwise it would dissipate. Ideally, a mind with amazing powers of self-control would delete the association between "wake up" and "put arm around girlfriend" as soon as the relationship with the girlfriend ended. However, a mind without emotional interference in its Hebbian network dynamics would do the next best thing: the association would gradually dwindle over time. For a typical human mind, on the other hand, the coupling of the "wake up and put arm around girl" network with the mind's emotional centers, will cause this association to persist a long time after simple Hebbian dynamics would have caused it to dwindle. The example of Bob and his girlfriend is somewhat simplistic of course, and I chose it largely because of its simplicity. A more pernicious example is when a mind becomes attached to an aspect of its model of itself. For example, someone who derives pleasure from being correct (say, because someone praises them for being correct), may then become emotionally attached to the idea of themselves as someone who knows the right answer. They may then have trouble letting go of this idea, even in contexts where the genuinely do not know the answer, and would be better off to admit this to themselves as well as to others. Becoming attached to inaccurate models of oneself causes all sorts of problems, including the creation of compoundedly, increasingly inaccurate self-models, as well as self-defeating behaviors. Now let's take a leap from modeling brain to modeling mind. I've been talking here about neural networks and brains -- but the core idea presented above could actually be relevant to minds with very different biological underpinnings. It could also be relevant if Hebbian learning turns out to be a terrible model of the brain. Regardless of how the brain works, one can model the mind as a network of nodes, connected by weighted links. The nodes represent concepts, actions, and perceptions in the mind; the links represent relationships between these, including associative relationships. The "semantic networks" often used in AI are a simplistic version of this kind of model, but one can articulate much richer versions, capable of capturing all documented aspects of human cognition. This sort of model of the mind has been instrumental in my own thinking about AI and cognitive science. I have articulated a specific network model of minds called SMEPH, Self-Modifying Evolving Probabilistic Hypergraphs. I won't go into the details of that here, though -- I mention it only to point out that the model of attachment and non-attachment here may be interpreted two ways: as a neural model, and as a cognitive model. These interpretations are related but far from identical. The model of attachment presented here relates closely to Stanislav Grof's notion of a "COEX (Condensed Experience) system." Roughly, a COEX is a set of related experiences organized around a powerful emotional center. The emotional center is generally one or a few highly emotionally impactful experiences. The various experiences in the COEX, all reinforce each other, keeping each other energetic and relevant to the mind. In a Hebbian perspective, a COEX system would be modeled as a system of cell assemblies, each representing a certain episodic memory, linked together via positive, reinforcing connections. The memories in the COEX stimulate powerful emotions, and these emotions reinforce the memories -- thus maintaining a powerful, ongoing attachment to the memories. I have said that "Attachment occurs -- neurally speaking -- when there is a circuit binding a cell assembly to the brain's emotional center, in such a way that emotion keeps the circuit whole and flourishing even though otherwise it would dissipate." But why would the human mind be that way? Emotions, basically, are system-wide (body and mind inclusive) reactions to events regarding system goals/desires/aspirations. We are happy when we are achieving goals better and better; especially happy when we're doing so better than expected. We are sad when we're making progress worse than expected. We're angry when someone or something stands in the way of our goal fulfillment. We feel pity when we use our mind's power of analogy to feel someone ELSE's frustration at their inability to fulfill their goals…. So, it's only natural that the emotion-bearing cell assemblies and attractors, wind up getting richly interlinked with other cell assemblies and attractors. Let's say the "wake up", "put arm around girlfriend" and "happy emotion" assemblies all get richly interlinked. Then there are multiple reverberating circuits joining all these assemblies. So even when the girlfriend goes away, these circuits will keep on cycling. This won't be such a problem for an animal like a dog -- because in a dog, the associational cortex is not such a big part of its neural processing -- immediate perceptions and actions tend to hold sway. But a larger and more complex associational cortex brings all sort of new possibilities with it, including the possibilities for more complex and persistent forms of attachment! In recent years there has been an increasing amount of work studying the brains of experienced meditators, and of people capable of various "enlightened" states of consciousness. One of the interesting findings here is that such individuals have unusual patterns activity in a part of the brain called the posterior cingulate cortex (PCC). The PCC does many different things, so the significance of this finding is not fully clear, and may be multidimensional. However, it is noteworthy that ONE thing the PCC does is to regulate the interaction between memory and emotion. The neural/cognitive theory presented above leads directly to the prediction that, if there's a key difference between the brains of attachment-prone versus non-attached people, it should indeed have to do with the interaction between memory and emotion. I thus submit the hypothesis that ... ONE of the significant factors the neurodynamics of enlightened states is: A change in the function of the PCC, so that in relatively non-attached people, emotion plays a significantly lesser role in the maintenance and dissolution of cell assemblies and associated attractors representing memories. This line of thinking, if correct, suggests that it may be relatively straightforward to create digital minds without the persistent phenomenon of attachment that characterizes ordinary human minds. First of all, a digital mind -- if its design is not slavishly tied to that of the human brain -- may be able to explicitly remove associations and other inferences that are no longer rationally judged as relevant. In other words, when a well-designed robot's girlfriend leaves him, he will just be able to remove any newly irrelevant associations from his brain, so his post-breakup malaise will be brief or nonexistent. The interaction between memory and emotion is valuable for many purposes. There is intelligence in emotional response, sometimes. But there is no need, from a cognitive architecture perspective, for the formation and dissolution of memory attractors to be so inextricably tied to emotion. To explore the notion of attachment in digital minds more concretely, let's take a specific AGI design and muse on it in detail. This exercise will also help us better understand why human minds get so extremely wrapped up in attachment as they do. What if Bob's mind were a mature, fully functional OpenCog AGI engine, instead of a human? There would also be a bunch of HebbianLinks, similar to synapses in a neural network with Hebbian learning, going between various nodes related to wake_up and put_arm_around_girlfriend, and various nodes related to Happy. When the girlfriend left, human-like attachment dynamics would likely be present, related to the HebbianLinks involved. But the probabilistic truth value on the PredictiveImplicationLink would decrease. It would decrease gradually via experience; or might be decreased very rapidly via reasoning (i.e. the AI could rationally infer that since the girlfriend is gone, putting its arm around her is not likely to be associated with happiness anymore). The question then is: How rapidly and thoroughgoingly would this change in the OpenCog system's explicit knowledge (the PredictiveImplicationLink) cause a corresponding change in the system's implicit knowledge (the HebbianLinks between the assemblies or "maps" of nodes corresponding to "wake-up", "put_arm_around_girlfriend", and "Happy")? Suppose the OpenCog system has a process that: Whenever the truth value of a link changes dramatically, puts the link in the system's AttentionalFocus (the latter being the set of nodes and links in the system's memory that have the highest Short Term Importance (STI) values, and thus get the most attention from the system's cognitive processes). Putting the link in the AttentionalFocus, will cause STI to be spread to the nodes that the link connects, and to other nodes related to these. This will then cause the HebbianLinks among these nodes to have their weights updated. And this will gradually get rid of assemblies and attractors that are no longer relevant. So this process that triggers attention based on truth value change, will serve directly to combat attachment. In the human mind/brain, explicit knowledge is purely emergent from implicit knowledge -- different from the situation with OpenCog where the two kinds of knowledge exist in parallel, dynamically coupled together. Obviously, given this, there must be neural mechanisms for changes in emergent explicit knowledge (derived via reasoning, for example) to cause changes in the corresponding underlying implicit knowledge. But these mechanisms are apparently more complex and harder to control than the corresponding ones in OpenCog.